REDDING, Calif. - Ten graduate students were honored for achievements in Simpson University’s Master of Arts in Counseling Psychology program during a recent evening reception on campus. About 40 people attended the Jan. 9 ceremony, which included a dessert reception. In addition to the students, an MACP faculty member and clinical supervisor were recognized, and a local psychotherapist was named Community Member of the Year. Leah Moua, for excellence in clinical practice. Haley Bagnaschi Sadler, for demonstrating significant professional promise. Susan Rhyne, for achievement in completing the teaching and learning capstone. Kimberly Corey, for demonstrating leadership skills. Susan Rhyne, for academic achievement. Amanda McNulty, for her commitment to work with diverse, marginalized and underserved populations. Bethany Bishop and Mark Sabo, for demonstrating significant personal, professional and clinical growth. Ariel Yarbrough, for perseverance in graduate school. Jill Piercy, for engagement in supervision. Rachel Smith, for consistency in graduate school. The program named Lynn Fritz as its Community Member of the Year. Fritz is a licensed marriage and family therapist, media producer and consultant who has been integral in connecting MACP students to people in the interfaith community and is a “favorite guest speaker” in the Diversity in Counseling course, said Dr. Addie Jackson, dean of the School of Graduate Professional Studies. Former professor Rebecca Carter, who passed away Dec. 21, 2014, was honored for Excellence in Teaching. 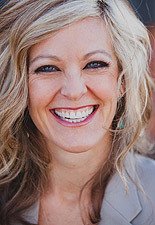 Professor Carter taught Family Therapy Theories and co-taught, with her husband, Mark, a course on Christian identity and professional development. She was also instrumental in creating the framework for the teaching and learning program capstone experience, during which she supervised a graduate teaching assistant in developing and teaching courses in the undergraduate psychology program. Simpson University’s M.A. in Counseling Psychology program began in January 2010. The program is designed to prepare students for licensure in California as marriage and family therapists or licensed professional clinical counselors. Learn more at simpsonu.edu/macp. Photo by Jessica Law. 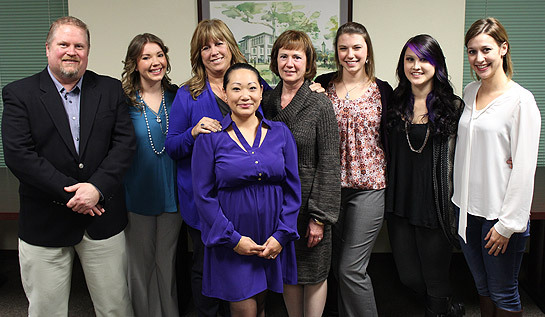 From left: Mark Sabo, Ariel Yarbrough, Jill Piercy, Leah Moua, Susan Rhyne, Amanda McNulty, Rachel Smith, Haley Bagnaschi Sadler. Not pictured: Kimberly Corey and Bethany Bishop.